Go to https://creator.amazon.com/ and sign in with the Amazon account you want associated with your app. If you have an Amazon developer account, sign in with that account. Otherwise, use the Amazon.com account that you want associated with your Amazon Creator app. Later in the process (when you publish your app), Amazon Creator will prompt you to auto-create an Amazon developer account from within Amazon Creator. An Amazon developer account is required to publish an app on the Appstore. You have three options for your video source: Youtube, Media RSS, or Brightcove. Choose YouTube if your videos are hosted on YouTube. Enter your YouTube Channel ID (or your YouTube username that has a channel associated with it) in the text box. For details on how to get your channel ID, see Get Your YouTube Channel ID. Amazon Creator attempts to validate the channel ID or username. If successful, you'll see a green check mark. If your videos are available through a media RSS feed, select this option. Enter your MRSS feed URL in the text box. See Use an Media RSS Feed to Configure Amazon Creator for details and a sample MRSS feed. After you enter an MRSS feed, Amazon Creator attempts to validate the MRSS feed. Then Amazon Creator auto-maps the app elements to the correct elements in your feed. Note: Amazon Creator shows you a sample of the data from the first item in the feed. This helps you see what will end up in the app. If the mapping doesn't identify the correct element, select the correct element from the element drop-down menus. For more information about configuring MRSS feeds, see Use a Media RSS Feed as Your Video Source. If your videos are hosted on Brightcove, select this option. 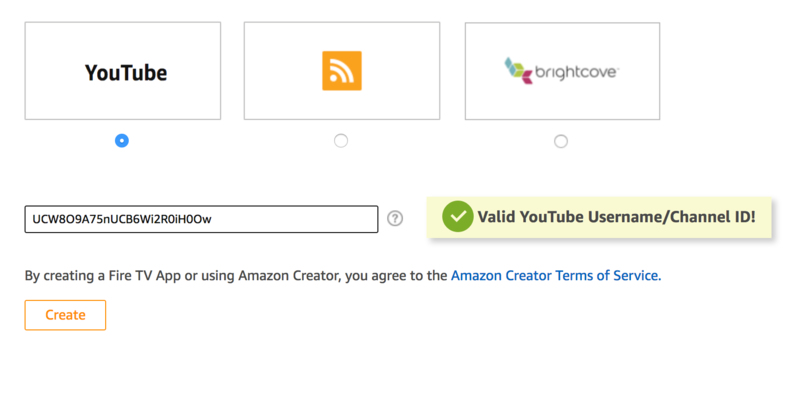 Enter the required Brightcove information (app name, account ID, client ID, client secret, player ID, and optionally a Playlist reference ID) needed to configure Amazon Creator. See Use Brightcove as Your Video Source for information on how to retrieve this information. 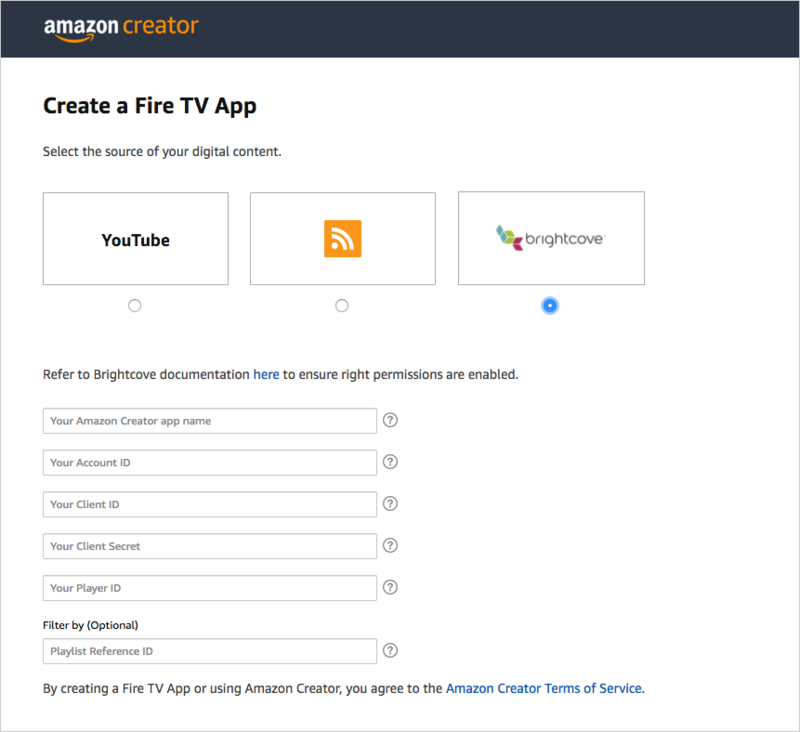 The only information not related to Brightcove in the fields is the one labeled "Your Amazon Creator app name." This refers to whatever you want to call your Amazon Creator app. It does not refer to the Brightcove app name. After you complete the fields, Amazon Creator attempts to validate the Brightcove configuration. If successful, you'll see a green check mark next to the valid fields. Note: After you select a video source option on this screen, you cannot edit it later. For example, if you decide to switch from YouTube to Media RSS in the future, you will need to suppress your YouTube-configured app and create a new one with media RSS configured instead. A preview of your app appears in the browser. 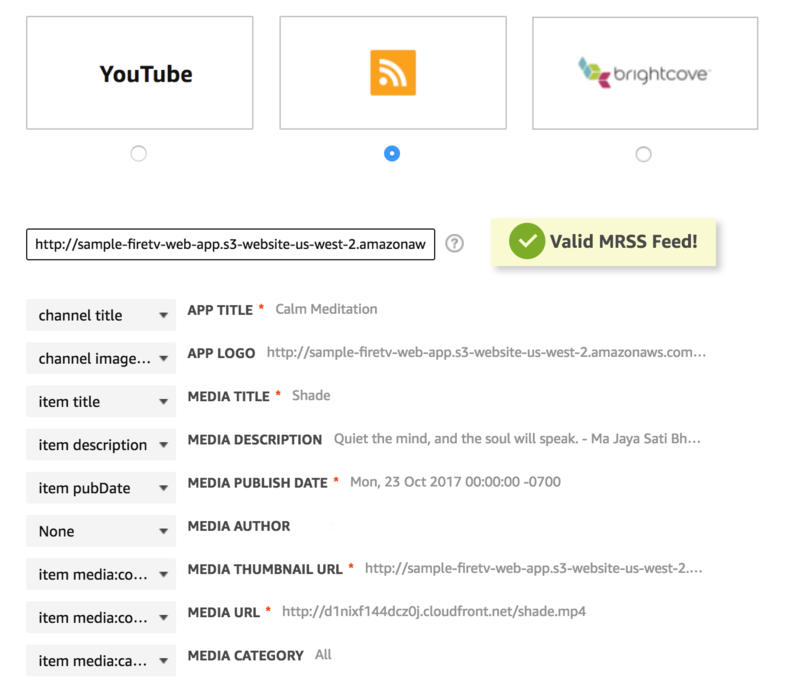 Your app's content will dynamically update each time the app starts (or the preview launches) based on updates to your YouTube channel, MRSS feed, or Brightcove videos. Need help choosing between YouTube, MRSS, and Brightcove? Here's a little more information. YouTube provides free online hosting that serves up your video in a stable, robust way. But if your videos aren't on YouTube (perhaps they're with another video host or on your own web server), you can use an MRSS feed or Brightcove instead. Using an MRSS feed requires you to host your video content outside of YouTube, on your own server or on a supported video host, such as Ooyala, Kaltura, AWS S3 with Cloudfront, or others. With the MRSS approach, you manage your video descriptions and other details through your feed elements. (Many times the video hosts will provide an MRSS feed for your content.) Note that you can use only a single MRSS feed per app. With MRSS feeds, Amazon Creator lists items in the category navigation bar based on the category element for each item. With YouTube, Amazon Creator picks up categories from the sections on your YouTube page. These sections can be based on playlists in your channel. With Brightcove, the playlists in the app are converted into categories in the navigation bar. Brightcove offers a professional platform for online video hosting, and as such, it gives you more features and capabilities, such as live streaming, a customizable player, interactivity, analytics, ad management and monetization, and more. For more details about why you might want to use Brightcove, see 5 Reasons Video is Better With Brightcove. Now that you've created your app, go to Preview Your App. 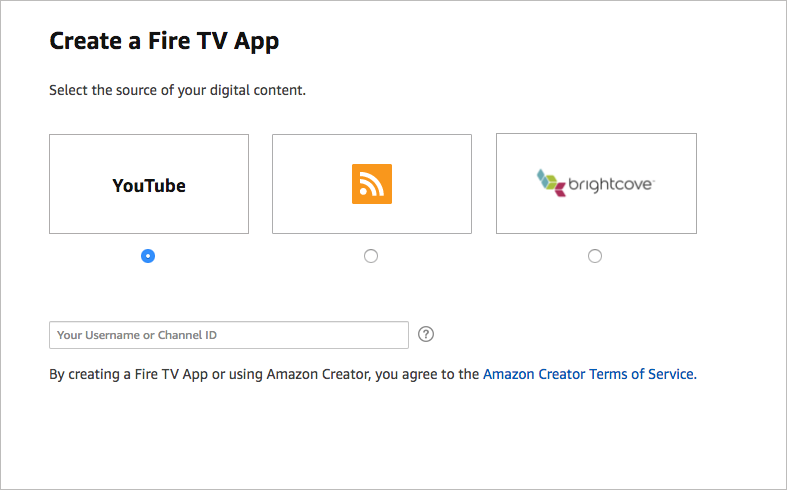 As you preview your app, you can experience how the app will appear on Fire TV and style your app's appearance — changing colors, images, and fonts as desired.